The flurry of visits and public statements is also accompanied by a flurry of postings and transfers, which has seen the face of the Military high command being altered, with new Chief of General Staff, DG ISI, and DG ISPR in place. 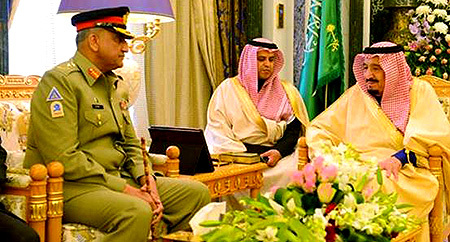 In addition, the COAS also undertook his first official foreign visit to the Kingdom of Saudi Arabia from January 17-19, 2017, where he called upon the King of Saudi Arabia and the Custodian of the Two Holy Mosques King Salman bin Abdul Aziz al-Saud, the Deputy Crown Prince and Defence Minister, His Royal Highness Muhammad bin Salma. In the developing saga of Gen. (Retd.) Raheel Sharif allegedly protecting Gen. (Retd.) Pervez Musharraf from his treason trial, the former Military-dictator-turned-President decided to step into the fray himself in December 2016. During an interview to Dunya TV’s Mr. Kamran Shahid on December 19, 2016, he stated that ‘He [Gen. (Retd.) Raheel Sharif] did help me and I am grateful… he helped me out because the cases are politically motivated. They [the PML-N Federal Government] put me on the ECL; they turned it into a political issue’. He went on to say that the Gen. (Retd.) 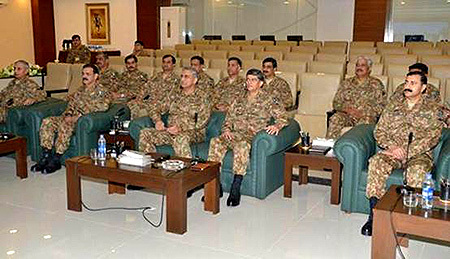 Raheel Sharif had ‘a role to play in releasing the pressure behind the scenes … Once he [Gen. (Retd.) Raheel Sharif] got the Government to relieve the pressure that they were exerting, the courts gave their judgment and allowed me to go abroad for treatment’. He also went on the say that ‘unfortunately, one has to say it, but shouldn’t have to… our judiciary works under pressure behind the scenes and then gives rulings’. The Prime Minister and the COAS met once during December 2016 on December 05, 2016 when Gen. Qamar Javed Bajwa called on the Prime Minister to ‘discuss professional issues related to national security’. This was a one-on-one meeting without the presence of the Federal Minister for Defence. Mr. Saleem Safi: General Pervez Musharraf kay khilaf karawayee par toh General Raheel Sharif bhi naraz thay na? Lt. Gen. (Retd.) Abdul Qadir Baloch: Jee, main itna kahoon ga kay General Pervez Musharraf jitna arsa hospital main rahay, bhaghair kissi wajah kay, aur jitna arsa Karachi main rahay, beghair adalaton main jayay, mairay khayal main ap keh saktay hain institution ka us kay liay kuch tha; there was something. Mr. Saleem Safi: Nahin yeh hakoomat ko unki taraf say nahin convey kia gaya tha kay General Pervez Musharraf kay saath yeh kuch na karain? Lt. Gen. (Retd.) Abdul Qadir Baloch: Main ap ko eemandari say batana chahta hoon Saleem Bhai keh joh political government hai Mian Sahib ki, main uskay bohat inner circle ka admi nahin hoon. Mujh say aisi koi cheez share nahin ki gayi thi. Mr. Saleem Safi: Laikin iss baat main toh koi do rayay nahin ho sakti na kay General Pervez Musharraf ko bachaya Raheel Sharif Sahib nay? Lt. Gen. (Retd.) Abdul Qadir Baloch: Haan bilkul signatures hain uskay. Main clarify kar doon keh political government ko ghari jamhoori tareeqay say change karnay kay sazishon main general Raheel Sharif involved nahin thay. Jahaan tak functioning ka taaluq hai meray liay bara mushkil ho gay eh justify kar laina kay bilkul 100% aik page pay civil-military government aik page pay thay. Mr. Saleem Safi: Was not Gen. (Retd.) Raheel Sharif also angry at the action taken against Gen. (Retd.) Pervez Musharraf? Lt. Gen. (Retd.) Abdul Qadir Baloch: I will only say that the fact Gen. (Retd.) Pervez Musharraf stayed in the hospital for such a long time, without any reason, and then also stayed in Karachi for such a long time, without going to court, I believe that you can say that institution was involved to some extent; there was something. Mr. Saleem Safi: But was the Government not conveyed that it should not initiate action against Gen. (Retd.) Pervez Musharraf? Lt. Gen. (Retd.) Abdul Qadir Baloch: Let me be honest that I am not amongst the inner circle of Mian Sahib’s political Government. Nothing of the sort was shared with me. Mr. Saleem Safi: But there can be no two ways about the fact that Raheel Sharif Sahib saved General Pervez Musharraf? Lt. Gen. (Retd.) Abdul Qadir Baloch: Yes, definitely it had his signatures. Let me clarify that Gen. (Retd.) Raheel Sharif was not part of any conspiracy to remove the elected Government through undemocratic means. As far as functioning is concerned, it will be very hard for me to justify that the civil-military leadership were on the same page.